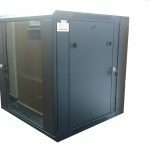 Netshield 19” Cabinets are available in different sizes as governed by IEC (Industrial Electro technical Commission) standards. They are normally black but if quantities justify it can be supplied in different colours, which are defined by the clients need and likings. Netshield supplies two types of cabinets: Floor standing and Wall mount with and without swing frames. The height can vary in “U’s” ranging from 4U to 47U – 1U = 44.45mm and a single piece of equipment can take up multiple “U’s” in a cabinet. The depth can vary from: 600, 800, 1000 and 1200mm deep for floor standing cabinets and 450, 550 and 650mm deep for wall mounting. o Standard: Only indoor – does not have any of the IPxx rated specifications.